Supplementary material reads: "Newsbureau, Lockheed, Burbank, TR 7-2711, ext. 1815. For immediate release. Palmdale Calif., Aug. 25: A record for the longest single-model aircraft building program in jet aviation history entered the books today when Lockheed Aircraft Corporation delivered its final T-33 jet trainer to the U.S. Air Force. In continuous production since 1948, the 11-year-old T-33 family grew to 5691 aircraft with a total dollar value of $570,000,000. Maj. Gen. Sam Maddux, Jr., deputy chief of staff for flying training of the Air Training Command, flew to Lockheed's jet center at Palmdale, Calif. to accept the final 'T-Bird' from G.A. Fitzpatrick, assistant general manager of Lockheed's California Division. 'This airplane has been the transition trainer between yesterday's conventional aircraft and the spaceships of tomorrow, and I feel certain that pilots of the first manned space vehicles will be former T-Bird students,' General Maddux said before taking off in the last T-33 for Randolph Air Force Base, Tex. 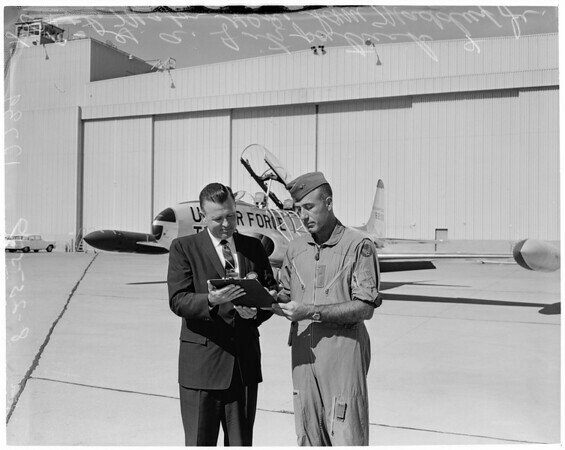 Since the versatile aircraft was accepted initially by the Air Force in August 1948, more than 27,000 Air Force pilots have won their silver wings in T-33 jet trainers. Early models of the jet-age 'flying classroom' were designated TF-80C, adapted from the historic F-80 'Shooting Star,' America's first production jet fighter. Benefiting from manufacturing economies achieved during the record assembly-line run, production time for the final T-33s was reduced to about 1/25th that required for the first F-80 from which the trainer was derived. Currently in service with 26 friendly nations around the globe, the T-33 helped train 9 out of 10 of the free world's jet pilots."